SAN DIEGO, CA – April 11, 2018 – Filmmakers are encouraged to submit their films for the GI Film Festival San Diego’s Local Film Showcase. The San Diego military film festival is Sept. 25-30, 2018 and now in its fourth year. The GI Film Festival San Diego is one of just a few military-themed film festivals produced in the United States. Just as the military is made of diverse active duty and veterans, festival organizers hope to see submissions which reflect a wide range of military experiences including stories from people of different ethnicities, races, genders, economic backgrounds as well as individuals who identify as LGBTQIA+. These perspectives are often overlooked, underrepresented and untold yet play an important role in U.S. military history and culture. The early bird deadline to submit is April 10, 2018 and the general submission deadline is May 15, 2018. Entry fees begin at $35 with discounts for active and former military, as well as current students. Local veterans and active duty military are invited to submit entries on any topic. Local student and professional filmmakers with no military background are invited to submit films with a military theme. Any (national or international) filmmakers are invited to submit a film on military subject matter based in San Diego County or Imperial County. A military-themed film that is made by individual(s) who reside in San Diego County or Imperial County. A military-themed film that features more than 60 percent of cast and crew from San Diego County or Imperial County. A military-themed film that was shot or edited within San Diego County or Imperial County. A film of any genre featuring above-the-line talent who is currently serving or has served in the U.S. military. Local filmmakers should reside in San Diego County or Imperial County. Above-the-line talent includes: director, writer, producer, and/or principal actor/actress. All submissions must have been completed and released after January 1, 2013. Submissions that meet the technical requirements will be screened by an advisory committee, which is comprised of local members of the military veteran community or representatives of San Diego organizations that serve military members, families, and veterans. The committee assesses the entries for thematic and production values, and then makes recommendations on the selections to be shown in the GI Film Festival San Diego 2018 Local Film Showcase. These films will also be considered for the festival’s awards program at the awards celebration. To be considered for the Local Choice Award, the film must have at least 60 percent of the cast, crew, and locations sourced from San Diego County or Imperial County. Competition is open to U.S. and international entries. Established in 2015, the GI Film Festival San Diego aims to reveal the struggles, triumphs, and experiences through compelling and authentic storytelling. All major film genres will be featured, including documentaries, shorts, and personal narratives. 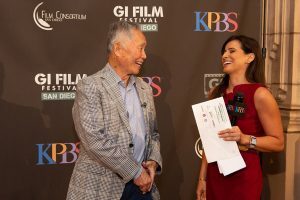 The festival is organized by KPBS in partnership with the GI Film Group and Film Consortium San Diego. Official sponsors of the 2018 GI Film Festival San Diego include: The Super Dentists, Bob Baker Subaru, and Scatena Daniels Communications. The GI Film Festival San Diego is a proud member of the San Diego Veterans Coalition. This summer, GI Film Festival San Diego organizers will announce the 2018 schedule, ticket prices, and venues. Many of the events will be open to the public with discounted opportunities for active duty personnel and veterans. Attendees can expect new features for this year’s festival, including an earlier Family Movie Night taking place August 24, 2018. Additional information is available at GIFilmFestivalSD.org.